The school year has begun in many parts of the country and, despite record-breaking heat, fall is in the air. This means football! Football begins on Red Grange field as the Wheaton Warrenville South Tigers take on the Glenbard West Hilltoppers from Glen Ellyn. 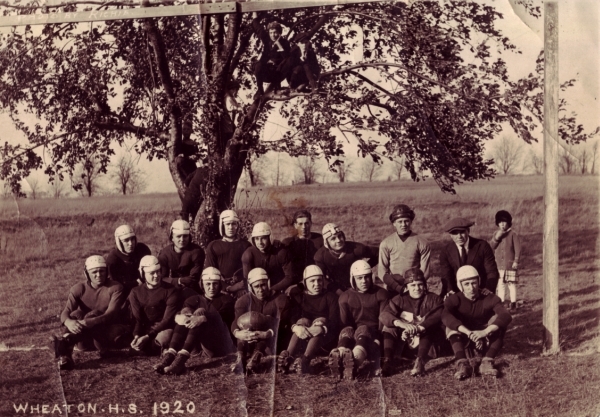 Over ninety years ago Harold “Red” Grange (first row, third from the left) donned a football uniform along with his fellow Wheaton classmates and made his way to the local field with its simple wooden goal posts. Before play could begin it was likely necessary that the field needed to be cleared of the many apples that had fallen from the trees around the field. The “Red” Grange collection at Wheaton College is the largest publicly available archival collection on this football great. It covers much of his life and career.